Alien vs Predator 3 is in the rumoured phase. We’ve heard nothing about another sequel since AvP Requiem was released. Producer John Davis mentioned in September 2008 that they’ve logically done all they can do with the AvP franchise. Colin and Greg Strause were adamant that they wanted to make Aliens vs Predator 3 when they were making AvP Requiem. They essentially wanted to make an AvP film in space, in the future but by the time they were hired, 20th Century Fox had already decided to go with Salerno’s script set on Earth. They incorporated elements of their ideas into the second film such as the Predator planet. ADI duo Tom Woodruff and Alec Gillis are also contenders for the director’s chair. 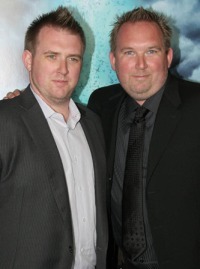 Having worked on the alien special effects in each movie since Aliens, Tom Woodruff revealed in April 2008 that he and Alec Gillis had aspirations to direct AvP Requiem themselves. Nobody specific has been mentioned though it’s doubtful anybody who appeared in the first two AvP films would appear in the third. The storyline for AvP3 is anybody’s guess. From the beginning, fans have wanted an Alien vs Predator film to take place in space far in the future. The Strauses had a few of their own ideas for a potential storyline. One of the ideas took place after Aliens and another one involved the space jockey creature seen in the original Alien. Of course, a movie set in space is costly and it’s obvious the studio doesn’t want to take the risk. If Alien vs Predator 3 does ever get the greenlight we could end up with another poor Earth-based setting. Shane Salerno also pitched a story to Fox where the Predator ship crashed in Afghanistan and the movie revolved around a special forces team. In the years to come after 20th Century Fox is finished with Ridley Scott’s Prequels and Soft Reboot, that the studios may reconsider approaching Alien vs Predator as a franchise. I love both of AVP movies. The plot i want to see is a team of solders, scientists are sent to a planet and ten predators and then the predator shot down there spaceships and the must survive the war between aliens and predators. I really what to see a alien Rex. I’m really hoping that AVP3 might still be in the works. Please. Strause brothers and Paul Anderson … Don’t touch again this franchise. There s not just ADI A new blood for these great characters Do you need help ??? And please , please not a sequel with this stupid predator killer iron man crapy ridiculous ugly armor ….. Just think about it , just an idea , a neomorph taking a look into an egg in Covenant ……..
Money is not everything …. Here’s a suggestion for the directors of the AVP, Predator series, and Alien movie series. Use the story line of the Alien vs Predator Three World War comic as a way to further the franchise. What I’m saying is, go by the comics like the Avenger movies are. Seeing how much profit their making, this can do the same. With another possible Predator movie underway, with the hint of the Predator suit in The Predator. Make one that is souly focused on the Predator’s homeworld, Yuaja Prime. And the Aliens homeworld as movies to further these two movie franchises. I really hope their possibly next movie can be based off of aliens vs predator fire and stone comics, that would be pretty cool. Also, when is the new alien game: “Alien: Blackout” coming out? The Predator made references to AvP. The Alien-tail spear. In fact, I think the facility at the end look similar to the one at the end of AvP-R. After Ridley Scott’s done with the prequels, perhaps Fox will attempt an Alien Versus Predator Cinematic Universe. maybe the new predator movie will launch avp3 just an idea. If they make a new AVP they need to to pick up with Sanaa Paths . Warning – if you won’t understand what I tried to say or something is not clear say it before you shout me down. I’m not native english user so it is possible I made mistake while writing this post. The problem with Aliens, Predator, and AVP movie series is that they desperatly try to connect new movie to the prequels… and that results as a freaking big mistake. Alien 2 is good sequel – Ripley warns earth about aliens, but they’ve already colonized the planet so she is somewhat “choosen to be volunteer” goes back just in time to find out the colony turned into hive. Very good idea, logical, and somehow fits. Then we get third part… – The start is somewhat logical as well, as they’re crashlanded beacuse they are already infected okay, nice following… but Is it really necessay to once again put the same civilian to fight monster? Well ripley become iconic so it’s understable… anyway it somehows goes by and your “avarage Mary” (finally) dies in the end. Movie managed to keep up as good but it started to feel like “We need to have her as a key link in our movie”. But there is way better keylink in the original story. And then we have alien 4 Ripley is dead so we are about to use the better kelink right? Not in a hell we’re cloning her. Heck! We need her in the series! Even though we know Weyland corp wants alien, we’ve seen that facehuggers were analyzed in colony so we’ve got pretty good reason to make a movie about reasercher spaceship with failed experiment and a Xenomorph going rampant on it. Ripley is not needed in a plot at all! If they could delibaratly change course of ship in part one (Ash secret mission) to get alien life form they could do it again with a different ship! Also this takes place in socalled “far future” so it could be done another few centuries later, when people forget about Nostromo case. Second movie – also good, no one tries to make it intact with the previous, (okay we’ve got goverment, propably Dutch mentioned this ugly killer) but it is great. Also we got more freedom in making sequels as we see a whole bunch of hunters at the end. And gets a glimpse at their hunting code. Third movie – finally someone did a bit of thinking and said “hey! This series gives as so much freedom that we do not even think how to link it with previous one! So let’s go make a movie that has nothing in common with previous… aside of our greenblooded monster(s).” And again we’re leaving at the point in which we can make a direct sequel or completely new story. Heck! We’ve seen predators fighting each others on the screen we could even make a movie about predators clans war! Also why could we not move the next one far into future, on a different planet (Predator wars on human colony? Rivalary between clans which gets more trophys?). Finally we’ve got AVP – nice idea (alternative to prometheus) of how Weyland corp gets its hand on Xeno’s info. Also pretty good background but was it really necesarry to make an action on Earth? I don’t know but the movie was great so it does not matter much. Then things sudennly takes a terrible turn… Has it really need to crash on Earth? Well if we consider the fact that these are movies for human i guess it okay (also as a reason why we won’t see predators-only war anytime soon)… but WHY make this predalien a qeen? It could just gone rampant! Terrifing monster! Hunted by another monster (BTW why it wasted time on skinnig humans if it came to beat the crap out of predalien? Waiting wor written invintation) human running away from Predalien, and bumping into Predator. it had such big potential but… something went wrong. To sum it up! These series both separetly and as crossover give us so much freedom but instead of making it a feat like predator directors do aliens directors desperatly tries to make it one big constant multi-movie storyline. And FAILS a big time! The AVP3 Also has big potential it just need to be done without thinking about how to link it with requem or aliens storyline. Lets make it farfuture. Space marines, finding some Xenos eggs or meeting Predator’s ship with Xeno’s qeen frozen on it. Heck! Why should earth be the only planet they made ritual hunting on? Some colonist could just land on another planet, with its native (primitive) population sacrificing they kin so the hunting could begin. GODDAMNIT We’ve got unlimited potential in this series! One series proved that the story does not need to be constant as long, as the key character (in both cases it IS monster that could easly wipe out rest of cast) stays intact. AVP also proven that it is possible to mix those unverses into a good story… so why nobody does it again? What if Cloned Ripley Came Back to Attack Lex to ? how about something that explains how the circular alien ship got to archeon in the first alien movie? IN the book aliens:original sin they kind of explain it, but there are still a few things missing for a complete explanation. They could do so much more with avp3. Everyone here in the chat could make up some sort of story line that would satisfy a lot of people. i love and am obsessed with alien and predator and neeeeeeeeeeeeeeeeeeeeeeeeeeeeeed to know if they are going to make another avp movie and for once put it in the aliens time line and make a facehugger get on something besides a humman or a predator. Please please please make the AVP3 movie. Oh man! Pls come out AvP 3.. The Predator shouldn’t be die..
. AVP was average AT BEST and AVPR was horrible. If they ever do another it needs to be done in space, with real actors and an actual story rather than the tripe they used in AVPR as NONE of the characters were likable in requiem. A LOT of you have idea’s that go well past the point of being moronic. It’s bad idea’s like you alls that have turned out horrible movies like all the new star trek movies, all the live action transformer movies, the garbage known as A Farce Awakens and Rogue One. AVP3 is a must. Its should be a three way adding in the USCSMC from Aliens. Marines respond to a colony that lost contact, after they deploy a Yaurja cruiser destroys the marine ship in orbit and of course the colonist had found the Xenomorphs somehow…. They should wait till after Ridley’s finished the Prometheus trilogy. Please mr Mac Tiernan … Mr Stephen Hopkins you are our only hope …..